Well Now I’ve Gone And Done It… | Uh...What? yes, thats my forearm, and no, thats not magic marker. yes, you read that correctly. been thinking about this for quite some time. 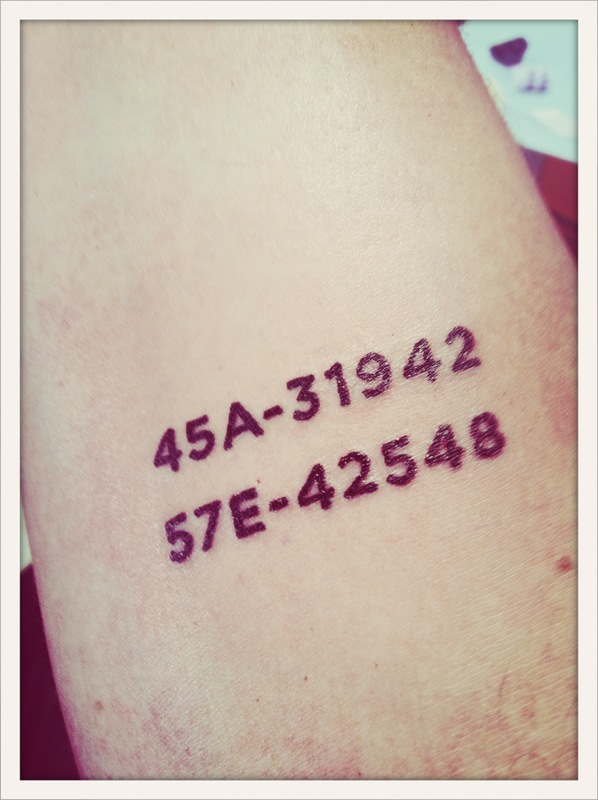 the numbers are coen’s and edie’s ear tattoos. i’ve always felt that a tattoo should be very personally significant. a greyhound’s ear tattoo is something unique to the breed, as well as unique to each individual dog. puppies are tattooed around the 2 and a half to three month old mark, and it functions very much like a social security number. its how you find out information about the dog, like its racing name, where it was born, when it was born, where it raced and how it performed. for example, that first number is coen’s, and starts with ’45A’. that means he was born in april (4) of 2005 (5) and was the first dog from his litter that got tattooed (A). kinda cool. i wanted to be able to always see it, too. thats why i went for the forearm. not worried abut it being so visible. if i ever need to cover it up, i can just put on a long sleeve. i also wanted to leave rom for future pups.